The vertical laminar flow hood can be used by itself or within a cleanroom to create smaller class 100 or class 10 clean zones. 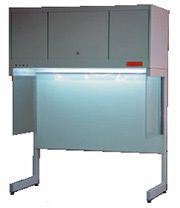 This vertical laminar flow hood model is offered in a great number of sizes, style and options. This versatility uses these pre-engineered options to create a reliable, customized hood for your specific application. The robust frame design permits the side shields to be removable. This allows a product to be transferred from one station to another always being within the controlled environment. Equipment can be placed within the open frame design. A work surface constructed of plastic laminar, solid or perforated stainless steel is available. Models are created in 4, 5, 6, and 8 foot lengths. Electrical outlets, gas connections, ionization, stainless steel or plastic interiors are but a few of the many option offered. This laminar flow hood is ideally suited for application where a cleanroom is too large or one does not want the contamination concerns of having the worker within the controlled environment.